Forbes Africa Person of the Year Named! Among the top 5 finalists nominated for this year 2013 prestigious Forbes award were: The richest African man, Aliko Dangote (Founder and President of Dangote Group), Patrice Motsepe (Founder and Executive Chairman of African Rainbow Minerals), Strive Masiyiwa (founder of global telecoms group, Econet Wireless), Jim Ovia (founder of Zenith Bank Group) and Akinwumi Adesina (Nigeria’s Minister of Agriculture and Rural Development). 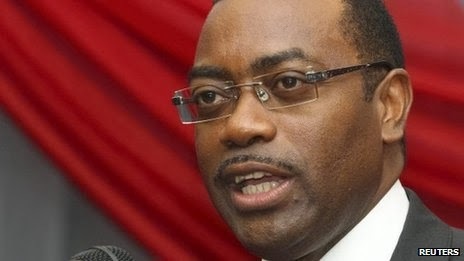 Notably, Adesina’s applaudable initiatives in the Nigerian agricultural sector have seen the empowerment of about 6 million farmers with modern day agriculture in Nigeria. It was indeed the survival of the fittest, considering the calibre of the finalists of the award. In his acceptance speech, Adesina said: “my goal is to make as many millionaires, maybe even billionaires, from agriculture as possible”. Going by the most important criterion in order to bag this award, it could be inferred that “Adesina is the only individual, who for better or worse, has had the most influence on events of the year”. Kudos we say to you! Congratulations on the conferment of your award! More grease to your elbow! It’s gonna be fun,entertaining,interactive & networking!!! Don’t miss out!!! The 1st democratically-elected South African President passes on at age 95!